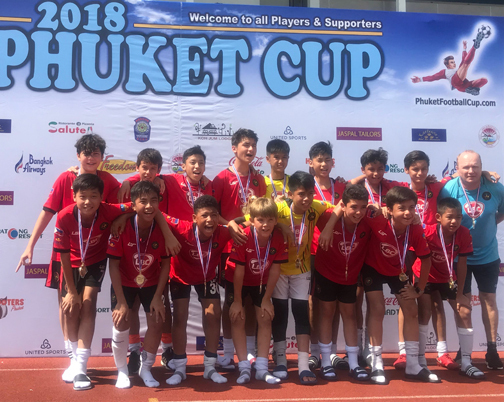 The Kaya FC Elite U13 team took home a silver during last week’s Phuket Football Tournament in Thailand after losing 1-0 to defending champions BIS Cruzeiros. Members of the Kaya FC Elite U13 team are shown at the awards’ rites displaying their silver medals. However, team captain Enzo Courbet won the tournament’s Most Valuable Player award. The lone Filipino team, which is this year’s U13 YFL Champion in the Philippines, earlier beat the Cruzeiros in the group stage, 1-0, but lost via a header goal off a corner kick in the finals. Kaya FC topped their group consisting of Thailand, Japan and Australia. “I think our team did really well against a good academy that has a tie-up with a Brazilian club. I think we are on the right track to improve football in the Philippines. We should not think we are behind among other countries in the region. We are as good as they are,” said Thomas Pfyl, the team’s coach. The Phuket Cup is an annual international football tournament in Thailand, which gathers high level football players in Southeast Asia under the 13 and 15 age groups, respectively.